Purchased but never installed, still in sealed anti-static bag!! Speed up your system’s performance with the Intel GM819 and avail superior results. 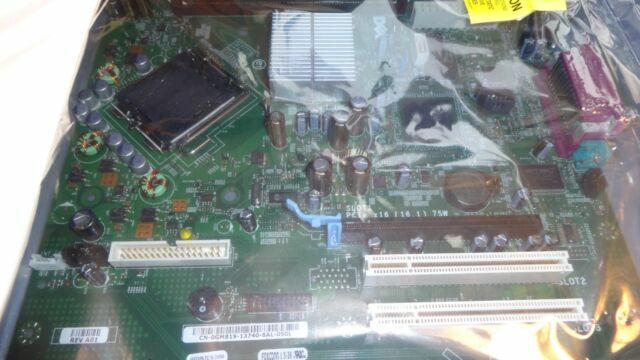 This Optiplex 755 motherboard works well with Intel Core 2, Intel vPro and Intel Celeron processors. Supporting 4x 667-MHz or 800-MHz DDR2 SDRAM, 8 GB in a 64-bit operating system and 4 GB in 32-bit operating system, this system motherboard renders speedy responses and a great memory. Integrated with the Intel Q35 Express chipset, this Optiplex 755 motherboard enhances gaming with improved graphics. The 9-Pin Serial Connector, 25-Hole Parallel Connector, two front and six back panel USB 2.0 connectors, this system motherboard ensures easy connectivity. The Intel GM819 also features PCI 2.3, PCI Express 1.0A and SATA 1.0A and 2.0 for expansion options. The board came well packed and even included the OE Dell SATA cables. One downside is that the motherboard came with a fairly early BIOS rev (A08) that didn't support the CPU my client's PC had so it wouldn't POST at first. Fortunately I had an E2180 laying around to bring the system up long enough to flash it to the latest BIOS (A022.) After that, the E7400 CPU worked fine and the PC is running very well fully loaded with 8GB RAM. Optiplex 755 Mini Tower brought back from the dead. Dependable mother board and a good core2 duo 8400. Okay not the fastest setup but it is some what fast and definitely smooth and responsive and with newly installed G skill memory it is running 100% faster than with generic memory. (don't wast your money on generic memory buy name brands that have life time warranty) Also new SSD hard drive has enhanced boot speeds to seconds not minutes! This was my first attempt at a computer rebuild and I am very happy with the end result. I now have a dependable responsive system. The local thrift store chain is selling used Dell OptiPlex computers for a fantastic price. Bought one only to find the network adapter on the motherboard didn't work. Found these boards for an excellent price. I could not distinguish this board from a new one. Installed it, fired it up, and everything works like it should. If someone has a OptiPlex 755 with motherboard issues, this is an inexpensive way to get your PC up an running again. I received the the item COVERED in dust, generally if you refurbish a product you at least clean the dang thing. I cleaned the thing off with canned air, plugged in my components and it started smoking. after further inspection components had burned out on the mother board. DO NOT BUY THIS.